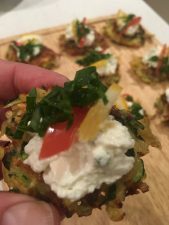 This is a very versatile recipe which can in small amounts form the base for canapes or be made into pancakes or standard sized fritters for a meal. Be warned that the mixture looks very strange however if you follow the recipe it does produce a surprisingly good product which is good served hot or cold. If making fritters place dessert spoonfuls of the mixture into the pan, turning as they cook. If making pancakes place ¼ cup servings of the mixture into the pan and squash into pancakes using the back of a fish slice. When cooked transfer the fritters/pancakes to a dish in the warming drawer of your oven until needed. If serving the fritters as canapes then these are easier to handle if chilled. They can be decorated with cottage cheese (plain or with chives) or avocado, slivers of tomato or red capsicum, lemon and extra finely sliced basil. If serving these as pancakes spread over with ricotta or cottage cheese, tomato salsa and rocket. Each Pancake contains: Energy 336kJ/80kcal, Protein 3.5g, Fat 1.7g, Saturated fat 0.7g, Carbohydrate 12g, Sugar 3.9g, Dietary fibre 9.8g, Sodium 61mgs.